How do we stay connected throughout the dementia journey? That is a question care partners and friends constantly ask. We are former family care partners who’ve interviewed experts from around the world. 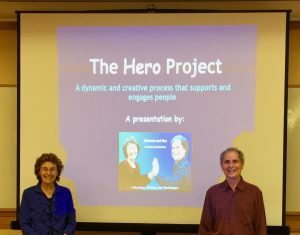 We have collected dozens of engaging, easy, and action-oriented ideas that help you keep those meaningful moments of connection with those you care for and about. Join us and experience the many benefits of using creativity and expressive arts to engage people living with dementia. This lively presentation shows you how designing an inland beach, swing dancing to the shower, and creating a list of favorite songs can tap into imagination and the creative spirit. Based on Deborah’s true stories, these presentations offer listeners insights into the caregiver’s emotional and spiritual journey. Throughout her mother’s Alzheimer’s, Deborah practiced finding the joys in each interaction, explored creative ways to connect with her mom, and developed new rituals to anchor holidays and celebrations. 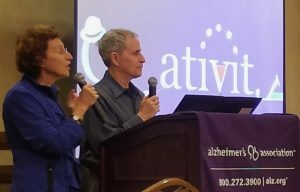 Deborah’s presentation, Love in the Land of Dementia, performed with Ron Zoglin, offers insight, humor and hope to family members, friends, and caregivers. Caregivers, family members, friends, long-term care staff, health care professionals, hospice workers, spiritual leaders, lay ministers and congregants have all benefited from listening to this program. —a simple individualized story created in a casual scrapbooking style. 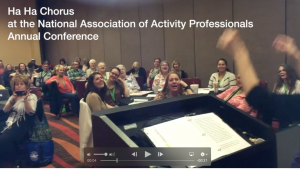 — Pam Husk, Marketing Event Planner, Foxwood Springs, Brookdale Senior Living, Raymore, Missouri. Love and Other Almost True Stories: Humorous and heart-warming tales exploring love in some of its strange and mysterious guises. The Heart of the Business: Stories that redefine, encourage and highlight the qualities that help keep businesses people oriented. Scribbling Outside the Lines and Other Leaps of Faith: Moments of personal boldness and flexibility.